The Nissan Micra has won the Gold Supermini Award in the 2018 Driver Power survey, one of the UK’s most definitive and respected customer satisfaction studies. The Micra was the best performing supermini in five of the nine Driver Power judging categories: Engine & Gearbox; Interior & Comfort; Ride & Handling; Infotainment, Connectivity & Electrics; and Safety Features. Generation 5 (2017 - Present): The legendary supermini lives on! Since 1983, the Nissan Micra has consistently met the demands of customers from all corners of the globe in terms of reliability and low running costs and the latest generation, called the Gen5, sets the standard for design, safety and style. Additional exterior and interior personalisation options allow for the creation of 125 different variations, enabling owners to stamp their own style on their new Micra. The Nissan Micra is available in various different 'grades' starting with the basic Visia then Visia+, Acenta, N-Connecta and finally the top Tekna grade. Now available with a new 1.0L Petrol engine which provides exceptional efficiency with the quick response you expect from a Nissan. Jump ahead of the pack with Micra's powerful turbo petrol engine IC-T 90PS. Micra shows how diesel is done, with stunning torque in the amazing DCI 90PS engine. 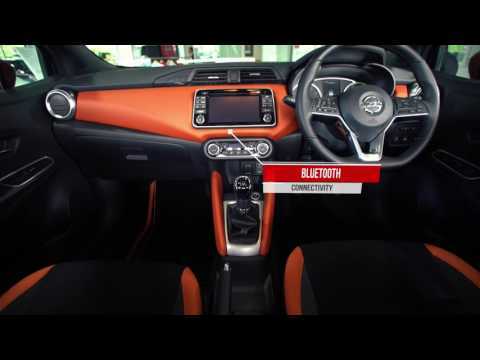 Micra with Nissan Intelligent Motablility transforms the way you drive. whether you're in city traffic, on the motorway or just parking, Micra can help make everything easier - so you can focus on why you love to be behind the wheel. See better at night without blinding your fellow drivers. High Beam Assist automatically turns on the high beam headlights when you need them, and switches to low beam when it detects a vehicle ahead​. Whether it's a distracted pedestrian or rogue shopping trolley, Micra's Intelligent Around View Monitor gives you an on-screen heads-up when something is moving near your vehicle -front,rear, or sides. Smooth out the bumps in the road. Intelligent Ride Control can automatically apply the brakes and adjust engine torque to smooth out your ride.